What is the Lympahatic System? 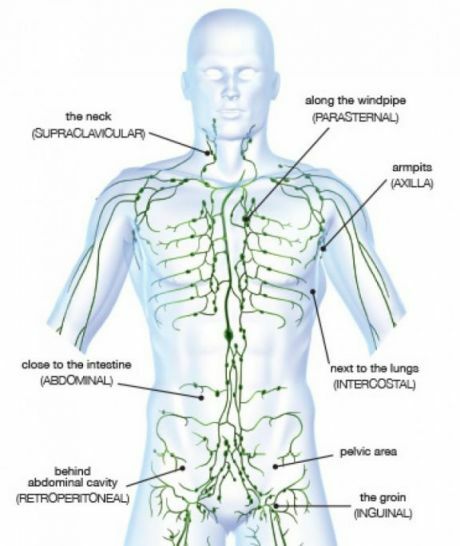 The Lymphatic system consists of a network of vessels (tubes) and nodes (glands) which are present throughout the whole body. We have c. 640 nodes - in the neck,under arms, groin, legs and abdomen mainly. The vessels contain fluid called lymph which forms in the body tissues, collected just under the skin by initial lymph vessels which drain into collector vessels which pump it towards the nodes where it is filtered, treated by bacteria and virus killing T and B lymphocytes, and then returned to the blood stream for eventual excretion by the kidneys. The nodes and an efficient lymph system therefore play an important role in fighting infection and are a vital part of the immune and defence system. Why do we sometimes get swelling in the limbs, face, neck and other areas? Sometimes the lymph flow is obstructed, slowed down, temporarily or permanently impaired for a number of reasons. This can be caused by some kind of trauma to due to injury or perhaps surgery, lack of movement, extreme cold or heat, or a number of other reasons. Also, if there has been an invasive operative procedure, sometimes there might have been some disturbance to lymph vessels or removal of the nodes. In these cases swelling can result due to lymph fluid being unable to be efficiently removed by the lymph ducts and vessels. In some cases the lymph swelling is not noticeable, particularly in the sub arachnoid lymph spaces in the brain where it has been proven that lymph blockage can lead to severe headaches and sinus problems and in severe cases certain neuro diseases and memory loss through damage to cranial nerve sheath and fibres - Cranial MLD can relieve such blockages and symptoms. How does MLD help reduce the swelling/ oedema? Manual Lymphatic Drainage (MLD) is a very light skin movement, without oil, which stimulates the lymph vessels just below the epidermis layer of the skin, and also the deeper lymph vessels, to temporarily pump more quickly in moving the excess tissue fluid and harmful waste matter (lymph load) via the lymph nodes (either directly, or indirectly to other nodes if nodes have been removed), and eventual flow into the vascular system for excretion. If there is any infection, virus, unhealthy or cancerous cells, the nodes contain the lymph for a period whilst the problem is dealt with by the T and B lymphocytes within the nodes ( the "killer" cells which form part of the immune system). This can cause the nodes to swell (swollen glands). What is the Vodder technique in applying MLD? The particlular form of MLD which I am trained in is the advanced Dr Vodder technique, which he developed in Austria in the 1930's. The therapist's hands move the skin lightly over the underlying tissues using a range of different repetitive, circular and spiral movements with changing pressure. The technique is complex and requires the therapist to have completed special training as well as examinations in anatomical theory and the study of different pathologies and the applicable techniques to treat those pathologies. The small skin stretches involved with each movement followed by a pressure less phase stimulate receptors which cause the lymph vessels to pump more quickly and in the direction of flow generated by the therapist towards the relevant lymph nodes. When is compression therapy used in addition to MLD? Sometimes a more constant pressure is required to be maintained on the lymph vessels following MLD. This would be in cases where there is more chronic lymphoedema causing swelling of the limb and /or lymphorrhea with associated adverse skin conditions. In these cases Combined Decongestive Therapy (CDT) is used which involves the application of compression bandaging, preceded by MLD, and possibly followed by a period of maintenance compression hosiery (which I measure the patient for).